The following will provide a general overview of moose and moose hunting which will hopefully include information for the well-schooled hunter as well as newcomers to the sport. The name moose is derived from the Algonkian name meaning "eater of twigs". Moose are the largest of the deer family with seven different sub-species recognized in the world, four of which inhabit North America. They are the Alaskan, Shiras, and the two which inhabit Ontario, the Eastern and Northwestern moose. Moose are generally the size of a horse, with long ears, humped shoulders, an elongated head and a "dewlap" or bell hanging from the throat. Their "gangly", awkward appearance is deceiving as it suits the diverse environment which they inhabit and allows them to travel over any type of terrain. They are capable of running as fast as 35 mph. and can swim or climb steep hills with equal ease. Although their eyesight is relatively weak, they certainly aren't blind, but their most acute sense is that of hearing which is aided by their "donkey like" ears that help the animal to pick up even minute sounds at great distances. Below is some general information specific to the Eastern moose, most prevalent in Ontario. Calves: Birthweight - approx. 30 lbs. Weight at 1/2 year - male 350 lbs. female - 330 lbs. Adults: maximum weight - male- 1200 lbs female - 850 lbs. For the most part, moose habitat is generally quite diverse including swampy areas as well as mixed forested higher ground. Summer will find them feeding more on aquatic vegetation, while during the fall season their diet shifts to include more leaves and shoots of hardwood trees and shrubs. Fresh or second growth areas are a favorite during the fall. Moose will still enjoy frequenting spots around lakes and swamps where yellow marsh "hay" is abundant. Generally speaking, an area which includes both young trees and swampy lakes would be considered prime moose country. During the summer, moose tend to spend most of their time within one or two square miles of "home territory". This begins to change somewhat during the fall, where bulls tend to be the greater wanderer, traveling up to 4 miles from their "home" area in search of a suitable mate. On bulls, antlers begin to grow early in the summer until their maximum size is reached by late August. Up until this point the antlers were covered by a "velvet" which now begins to have a reduction in blood flow causing the covering to gradually peel off, resulting in the more polished, bone like structure seen in the fall. In the winter, sometime between December and March / April the antlers are shed and the process begins anew. The Hunt: Moose hunting, like all big game hunting, requires a good deal of preparation and planning, as well as all the necessary equipment. The large size of a moose dictates that a suitable caliber rifle be used. The rifle should be one which maximizes your potential opportunities while minimizing the animals unnecessary suffering or loss. 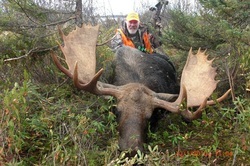 Many caliber's are considered suitable for hunting moose, as long as they have the necessary power for a clean kill. A heavier bullet is recommended for game the size of a moose, as it is the bullets weight which influences penetration and expansion. This will, of course, lead to somewhat less velocity, producing poorer trajectory, but, in turn produces more shocking power at relatively shorter ranges, thereby being more effective for game as large and as tough as the moose. Below is a chart of popular moose caliber's and bullet weights.